I have another "Colorful Blessings" card to share. I can't even begin to tell you how much I have enjoyed making these cards. The card fronts are as enjoyable to color as coloring in an adult coloring book...but better, because I can give my card to someone else to enjoy when I'm done. I usually color my card fronts while watching TV and make the card later. And if you have no idea what I'm talking about, check out these posts here and here. Some of the images in the card front collection are easier to color than others. This one I really struggled with because most of the image is water and what color do I color the fish? I decided to go with various shades of blue for the water, and to keep more with a monochromatic theme, I went with purples and reds for the fish. I really wanted the sentiment to pop out from the busyness of the card, so I actually cut it out using a circle die from Spellbinder's Nestabilities and then popped it up on dimensionals. I used a corner rounder to round the edges of the main image panel and the white panel behind it. I felt rounding the corners echoed the round image. Before I go I want to apologize for not having any fashion posts this week. My DSLR was in the shop for repairs. We tried taking pictures with my IPhone, but I didn't think they were blog worthy, so I just decided to skip it for this week. I do have a new Stitch Fix box coming this weekend, and I got my camera back, so expect me to be back on a regular blog schedule next Monday. Beautiful card. Hope the fixes to your DSLR weren't terribly expensive. I need to force myself to use my good camera and not my phone camera for clothes posts, I hesitate to call mine fashion posts!! What a beautiful image Amy, reminds me of a Kaleidoscope! 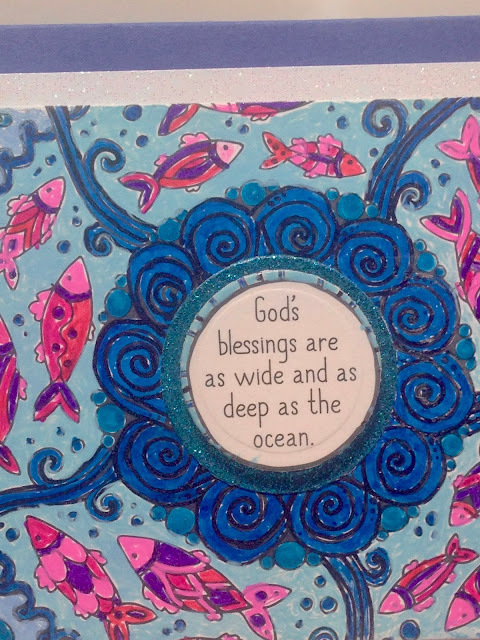 Wonderful card and the included sentiment fits the ocean theme so well! And loving the colors you picked! Thanks Ellie! I'm so glad you mentioned that because I had the same thoughts when I was writing my post but couldn't think of the word "Kaleidoscope" to save my life! ha ha! Yes, it definitely looks like a kaleidoscope. 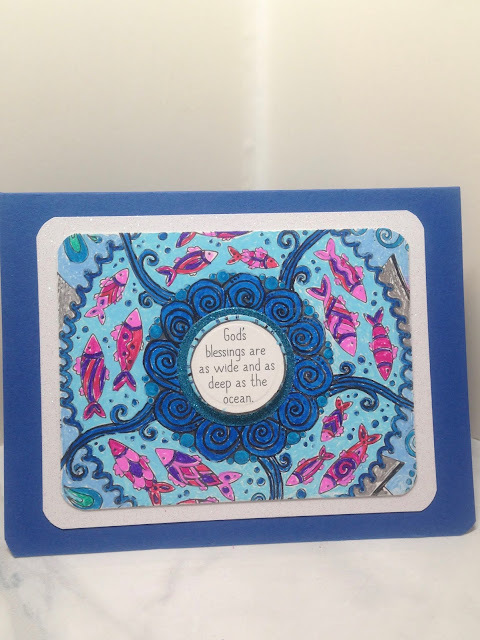 I love and enjoy handmade cards and anything handmade. Means they took the time to think about me and do something special. This turned out so good, lady! Thanks Nikki. You know what's funny, I need glasses to when I color. But I don't use my $500 pair of bi-focals, I find a cheap $3.00 pair of drug store reading glasses works better! Save the $ and go buy a pair of reading glasses! ha ha!